The March/April 1987 Biblical Archaeology Review reported on excavations at Arad, an ancient Israelite fortress located in the Negev Desert about 40 miles south of Jerusalem. “This Israelite fortress at Arad is unique in the Land of Israel. It’s the only site excavated with modern archaeological methods that contains a continuous archaeological record from the period of the Judges (c.1200 B.C.) to the Babylonian destruction of the First Temple (586 B.C. )” (Herzog, Aharoni, and Rainey 1987:17). The last settlement strata, from the ninth to sixth century B.C. is contemporary with Lehi and his departure from Israel shortly before the destruction of the First Temple. Among the significant discoveries were an Israelite temple (at the time the only other one known besides the one in Jerusalem) and archives with political, administrative, and religious documents in a singular series of inscriptions. 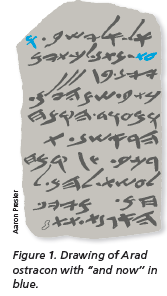 Among the large quantity of ostraca (potsherds with inscriptions on them) were a number which featured a “standard opening” phrase—“and now.” This information was presented in both an article (“With Power and Great Glory,” Smith and Smith 1987) and a PowerPoint presentation (“Arad,” Smith 2005). And now [the standard opening], give the Kittyim three baths of wine…. It then lists the amount of flour to be issued (Rainey 1987:39; see Figure 1 below). Numerous examples at Arad of the use of “and now” as a standard opening testify this was the usual way to commence a written communication after the salutation. And now, my beloved brethren, I would that ye should come unto Christ… (Omni 1:46 [1:26]). And now I, Nephi, declare unto you, that this prophet of whom Moses spake, was the Holy One of Israel (1 Nephi 7:46 [22:21]). And now there are many records kept of the proceedings of this people… (Helaman 2:12 [3:13]). Over the years I have seen many archaeological evidences that I believe accurately portray the historicity of The Book of Mormon. By this, I mean they show that The Book of Mormon provides correct information about the people, their language, culture, and history. 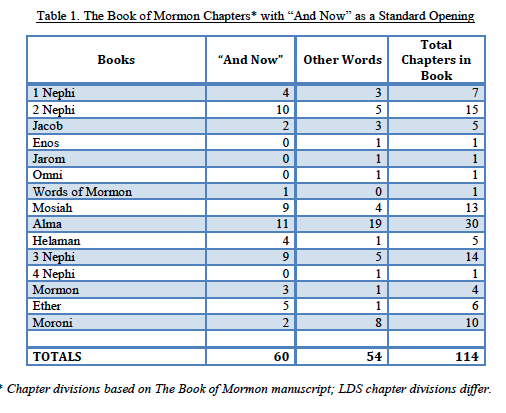 Joseph Smith could not have known in 1830 about the use of “and now” as a Hebraic “standard opening” in the fifth and sixth centuries B.C. The evidence discovered at the Arad site in the desert of southern Israel clearly demonstrates the narrative in The Book of Mormon is correct for that ancient time period. 1987 Arad. Biblical Archaeology Review 13(2):16-35 (March/April). 1987 The Saga of Eliashib. Biblical Archaeology Review 13(2):36-39 (March/April). 1987 With Power and Great Glory. The Witness 59:1-4 (October). Reprinted from Quetzal Codex Issue 5:2013. Used with permission. Edits by editor of glyph notes and approved by author.